November will be marked by two concerts from the cycle “Month of great jubilee ” of the RTS Symphony Orchestra and Choir. 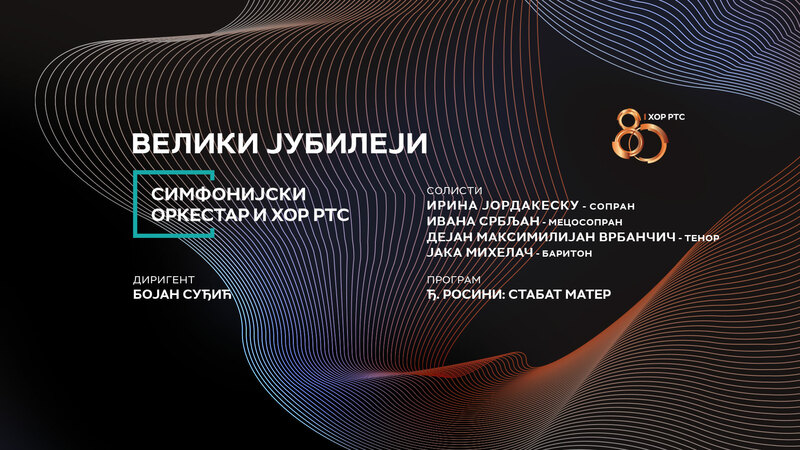 At the first concert, on 3 November, one of the most representative works of domestic concert literature, “Rhapsody for piano and orchestra” by Stevan Hristic will be presented, where pianist Natalija Mladenovic will perform as soloist. Besides this work, on the program will be also the symphonic picture of “The Sea” by Claude Debussy, as well as “St. Cecilia Mass” by Charles Gounod, in whose performance will be soloists Sofija Pizurica, soprano, Ljubomir Popovic, tenor, and Nebojsa Babic, baritone. The second concert, on 14 November, will present to the audience one of the most famous works of vocal-instrumental music – “Stabat mater” by Gioachino Rossini. Soloists will be Irina Jordacesku, soprano, Ivana Srbljan, mezzo-soprano, Dejan Maksimilijan Vrbancic, tenor, and Jaka Mihelac, baritone. Both concerts will be held in the Concert Hall of Kolarac Endowment, at 20:00. Conducted by maestro Bojan Sudjic. Copyright © 2008 – 2018 RTS. All rights reserved.